When a nonprofit organization follows the same structure as a corporation, it is subject to many of the same liabilities. Workers who are employed by nonprofits, and usually volunteers as well, are given the same the protections as workers who are employed by for-profit businesses. Additionally, because workers and volunteers are protected from personal liability for work done on behalf of the organization, the nonprofit itself can be held liable for their actions as well. Regardless of whether lawsuits against an organization are warranted or not, money and time still must be spent on defending claims. Understanding what the most common lawsuits for nonprofits are, can help organizations be more proactive in preventing them, saving them time and money that can be better utilized to support their mission. Below are the most common lawsuits for nonprofits as well as ways to protect an organization from these types of claims. All too often, nonprofits’ staff conduct business with oral agreements or through email correspondence rather than a legally binding contract. While these goodwill arrangements often work out just fine, they can sometimes end unfavorably. Without a clear contract, both parties are left unprotected, and a misunderstanding can quickly escalate into a lawsuit. In order to protect against costly and time-consuming agreement disputes, nonprofits should always establish a clear, written outline of any arrangements with other parties. 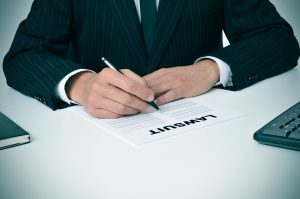 Contracts do not always have to be lengthy, but they should include a general description of the agreement, a list of what both parties are agreeing to deliver, any costs or fees, a deadline or schedule if applicable, any necessary indemnification clauses and the circumstances by which the contract can be terminated. While personal injury lawsuits are not the most common of the claims brought against nonprofits, they do occur quite often, and they are usually preventable. Personal injury, or “tort” claims as they are often called, can arise from a physical injury, emotional distress, or damage to property or reputation. Whether the events that led to the injuries or damages were the result of accidental or intentional actions, the organization can be held liable and be forced to pay the plaintiff’s medical bills, legal fees, personal suffering and more. Tort claims are most often the result of accidents, so simple preventative measures can reduce their risk. Requiring that all staff are familiar with and following OSHA guidelines can help keep employees safe and injury-free and foster an overall sense of safety-mindedness among workers and volunteers. Ensuring that all walkways are clear and free of hazards can help protect against slip-and-fall or other injury claims from visitors. Nonprofit organizations can also benefit from general liability insurance to help pay for legal fees and medical bill in the event that a third-party injury does occur on their property. The most common - and often the most costly - claims against nonprofits are employment law-related claims. Harassment, wrongful termination, retaliation, discrimination and wage-and-hour disputes are among the top claims against nonprofit employers. Although most nonprofit employers do not intend to violate employment laws, operating on limited financial resources can lead an organization in that direction. Some nonprofit employees may even be more than happy to work extra hours without overtime pay for a cause they believe in, but regardless of their demeanor, this is still an unlawful employment practice. Nonprofit workers and volunteers have the same rights and protections as for-profit workers. That means that nonprofit must follow and keep up-to-date with the ever-changing employment legislation as it applies to employers. Being familiar with both federal and state laws employment laws can help reduce the risk of employment law claims against a nonprofit employer. Additionally, nonprofits can outsource their employment practices to an HR outsourcing provider, who can provide them with the necessary expertise to ensure they are operating in compliance with all federal and state employment laws and regulations.